Who are classical music fans gonna call beginning this fall? 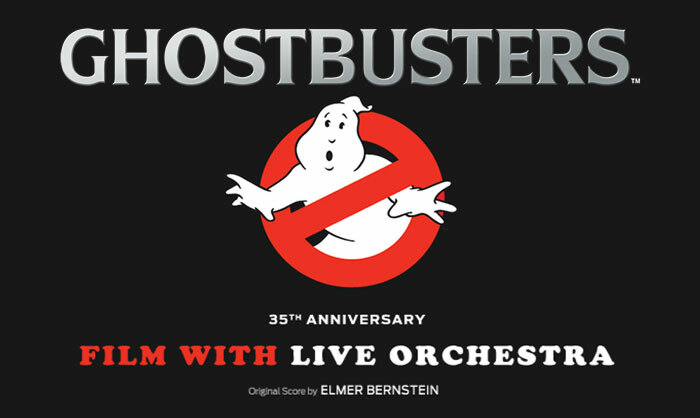 There's only one answer as festivals, symphony orchestras and performing arts centers around the world present "Ghostbusters Live in Concert" – a screening of the 1984 classic with live orchestral accompaniment featuring Elmer Bernstein's Grammy-nominated score and Ray Parker, Jr.'s #1 hit "Ghostbusters." At each presentation, Peter Bernstein, orchestrator of the original film and son of the Academy Award®-winning composer, will join the local orchestra as guest conductor. Ghostbusters Live in Concert will be presented in cities around the globe commencing in Fall 2018. Columbia Pictures, Ghost Corps and Schirmer Theatrical are teaming to present the event. "I'm thrilled to be presenting Ghostbusters with a live focus on Elmer Bernstein's brilliant score," Ivan Reitman, principal, Ghost Corps, said. "I've always felt that his remarkable music was the magical glue that held together the film's unique mixture of funny, mysterious, and scary." "This is a completely new way to experience the timeless classic Ghostbusters with live accompaniment from symphony orchestras," Adrian Smith, president, Sony Pictures Releasing said. "Ghostbusters Live in Concert promises to be an extraordinary film with live orchestra experience for audiences of all ages," Schirmer Theatrical President Robert Thompson said. "What makes this particular production unique is that both the film's director, Ivan Reitman, along with Peter Bernstein, orchestrator of the film and son of Elmer Bernstein, are directly involved in creating this show, along with the wonderful team at Sony Pictures and Ghost Corps. We're all very excited to bring Ghostbusters Live to international audiences." "I am deeply excited to be able to bring Ghostbusters Live to the concert hall," Peter Bernstein said. "Working for my father as an orchestrator all those years ago was a unique and wonderful time. To be able to bring that score back to life and conduct it is thrilling both professionally and personally." The 1984 blockbuster, a two-time Oscar® and two-time Golden Globe nominee produced and directed by Ivan Reitman and written by Dan Aykroyd and Harold Ramis, stars Bill Murray, Dan Aykroyd, Harold Ramis, and Ernie Hudson as eccentric parapsychologists who start a ghost-catching business in New York City after their careers in academia go awry. Sigourney Weaver and Rick Moranis co-star. Ghostbusters Live in Concert is produced by Schirmer Theatrical under license from Sony Pictures, Ghost Corps, and Sony/ATV Music Publishing/Raydiola Music. For more information and bookings, visit schirmertheatrical.com/ghostbusters. Sony Pictures Entertainment (SPE) is a subsidiary of Sony Entertainment Inc., which is a subsidiary of Tokyo-based Sony Corporation. SPE's global operations encompass motion picture production, acquisition, and distribution; television production, acquisition, and distribution; television networks; digital content creation and distribution; operation of studio facilities; and development of new entertainment products, services and technologies. SPE's Motion Picture Group includes film labels Columbia Pictures, Screen Gems, TriStar Pictures, Sony Pictures Animation, and Sony Pictures Classics. For additional information, visit sonypictures.com/corp/divisions.html. Schirmer Theatrical, LLC, part of the Music Sales Group, was founded in 2014 to develop concert and stage properties owned or administered by the Group. Since the company's founding, Schirmer Theatrical has quickly become a leader in symphonic cinema, producing such film with live orchestra projects as the Oscar-winning The Red Violin (score by John Corigliano) and The Pink Panther (score by Henry Mancini), along with high-end, fully-licensed symphonic experiences such as Women Rock (a tribute to female songwriters of the '60s-'80s), Revolution (the story of The Beatles at Abbey Road), among others. "Academy Award®" and/or "Oscar®" is the registered trademark and service mark of the Academy of Motion Picture Arts and Sciences.